Going into EDIT MODE exposes a lot of the features and customization of PolyHarps. Configures the setup of the current String Area. Read String Area to read about those controls! Here are the various edit sub-modes which interpret editing gestures differently, which you can pick from the radio control box. Play is a way to play the PolyHarp safely while still in editing mode. It's for testing while creating new layouts! Move/Set lets you move buttons around, move all the Chord Buttons around, and scale and position them. Double tapping a Chord Button in this mode opens up a configuration editor(Chord Buttons and Bars ). This mode also lets you create, delete, move, duplicate, resize and otherwise configure String Area properties. This edit mode screen labels all the String Areas and their corners. It also labels all the Chord Buttons. Touching and moving a Chord Button lets you reposition it. Read Chord Buttons and Bars for more details. Touching a String Area makes it "current", its edges are outlined, and its properties are made editable in the menu at the bottom of the screen. The String Areas have resizing circles on their corners. Move them to change the size of the String Area, and touch the middle of a String Area to just move it around. The resizing circles have the string area's number in it in the quadrant that puts it "inside" the string area. If you overlap them or flip them, you can get an idea of which corner is which! If you overlap some string areas' corners, you can drag them together and they will share the same spot. The Quad button frees the string area from rectangular constraints. 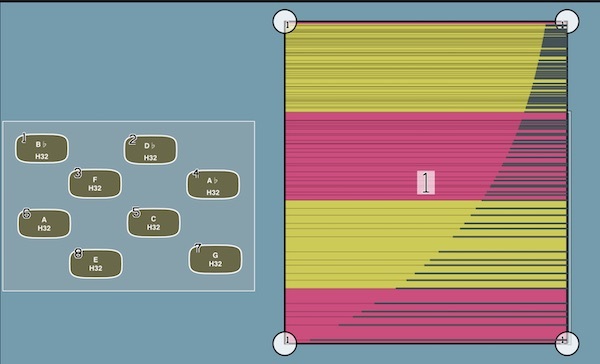 You can make any four-sided harp now, even twisting and overlapping the strings. It can be flipped, turned upside down, or twisted. The Touch Mode button determines how a touch on the strings in this String Area is interpreted. Strum means you have to strum over a string. Simply touching it is not enough. Tap means you can just tap a string and it will play it. Actually, it acts like a little strum of a range pixels under the tap, in order to be able to hit the string. The range depends on how hard you press on the screen - really, how wide the touch is. You can strum as well. Slap plays all the strings right away. Like slapping them with a ruler, or like using a "hammer on" Chord Button. Near Is like tap, but it plays the nearest string to where you touched. Again, you can strum it too! Dup makes a duplicate of the current String Area, inset slightly so you can move it more easily. Delete removes the current String Area. Shrink makes The Area smaller in case it exactly overlays another string area. String Areas can not only be associated with a built in synthesizer, but also with a MIDI channel and MIDI program. Clean is for helping to align Chord Buttons, which is a strange process. first you "collect" a series of Chord Buttons by dragging over them. It helps to be pretty far from the first button you collect. It's a little like sticking food on a skewer. Then with two touches, you can evenly align a row of them. It takes some getting used to! When the grid is on, the endpoints are aligned to the grid (not the Chord Buttons). Create is for creating and deleting new Chord Button. Tapping on a place outside of the "range" of an existing button will create a new button. the "range" is marked with a circle. It makes a copy of whatever you edited last, or a default button. You can tap on an existing button and then tap in a blank space to make an instant copy of it. You can use multi touch to make a lot of buttons and move them around. If you hold a button for a little while, the mini editor comes up, as it does in "Move/Set" mode. In general, it's easier to do this in Move/Set mode. If you tap four times, it removes all the buttons. Grid puts up a grid that is 60x60, and successive taps make it 45x45, 30x30, or 15x15, (and then off). This may change! Certain movements for editing the PolyHarp are now snapped to a grid. For instance, moving Chord Buttons or the whole set of Chord Buttons will snap them all to grid marks. String are corners can be snapped to the grid as well.